Want to connect with Pete? We are a local interior and exterior painting company with ten years of experience! Specializing in New or existing construction! Quality work at GREAT prices!!! 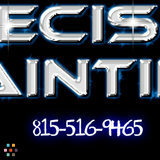 Call Precision Painting for all of your painting needs.